If you have taken the first steps towards buying a diamond, you will undoubtedly have repeated the mantra of the Four C’s and be familiar with clarity grading. A clarity grading is given based on the presence and appearance of flaws in a polished diamond. These flaws are placed into two categories; blemishes and inclusions. A blemish appears on the surface of the stone, while an inclusion is an internal flaw. You may have seen the GIA clarity grade scale, which grades diamonds from IF (internally flawless) to I3 (included). The grading the diamond receives is extremely significant as it will indicate the value of the stone, however it does not necessarily tell us about other factors regarding the clarity characteristics or appearance of the diamond (for example, whether of not the diamond is ‘eye-clean’). For this, a deeper look at clarity characteristics is required. Diamonds are naturally formed in the earth as a result of intense heat and pressure; these conditions can often result in inclusions and blemishes within, and on the surface of the stone. Like a snowflake, the formation of each diamond is entirely unique and many consider these inclusions ‘birthmarks’ within the diamond. Although most familiar with the small, black carbon flecks that present themselves in a diamond, there are in fact multiple forms that an inclusion can take; each inclusion is the product of a different formation condition and will have a different effect on the appearance of the stone. Interested in knowing what causes flaws in a diamond? You can find an in-depth look at types of diamond inclusion here. If you’re looking for flawless diamonds with the perfect cut, consider the A CUT ABOVE® VVS diamonds from Whiteflash and fancy cut diamonds consider Blue Nile. As part of this stringent grading process, the GIA appoint expert graders to determine what kind of inclusion is present and its exact placement. Their findings are then recorded on a diagram and this document (known as a Diamond Inclusion Plot) becomes part of the diamond certificate. While a diamond inclusion plot can help you to identify the location of inclusions, it is not definitive in expressing the actual appearance of the diamond. Furthermore, you may find that smaller diamonds (usually anything below 1.00ct) will not be accompanied with a diamond inclusion plot. 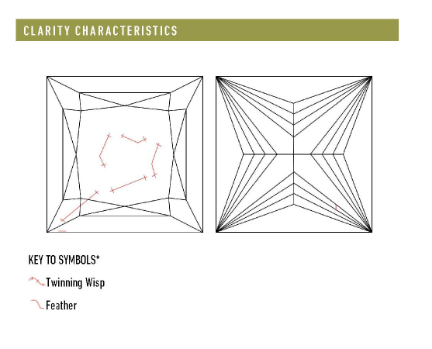 Neither the final grade, the grading specifications nor the diamond inclusion plot are a substitute for seeing the diamond through high-res imaging. To get to grips with inclusions, I recommend starting with a look at diamonds by James Allen. Their images and videos are very high quality and are great for buyers looking to understand the finer details of diamonds. I would also look at Blue Nile, as well as Whiteflash who also have HD videos, the highest quality diamond imaging and a very detailed Education Center to help you learn more about diamonds. Can I Rely on my Grading Report? First, I must point out that GIA or AGS certification is absolutely essential when buying a diamond. It really is the only way to know what you are buying. You can absolutely rely on the GIA to provide you with accurate data regarding the quality of your diamond. However, when it comes to clarity, your report should be used in conjunction with high-res imaging and a close look at the diamond. The diamond inclusion plot for this SI1 graded stone shows a multitude of different inclusions. As the GIA define an SI clarity grade as having inclusions visible under a 10x magnification, it is fair to assume that the diamond would present visible inclusions. However, in the photo on the left, we see that even under a 20x magnification, the inclusions are virtually impossible to spot. This is a beautiful, eye-clean diamond, however knowing what we know about an SI clarity grading and a look at the diamond inclusion plot may send some buyers running. By contrast, this SI1 diamond has a fairly clear diamond inclusions plot, however a closer look at the diamond and we can see the crystal inclusion clearly in the table of the diamond. To buy this diamond blind, based only on grading and inclusion plot may lead to extreme disappoint when the diamond is viewed by eye. Understanding clarity characteristics and how to identify them will empower you to look past the final grade, and begin to understand how these finer details can have a huge impact on the beauty of your diamond. After you have familiarized yourself with reading a lab report and identifying inclusions, I recommend heading to Whiteflash to take a look at their unrivaled inventory of super-ideal cut diamonds. Don’t have the budget? For a larger selection of more commercial diamonds head to Blue Nile. Like a fingerprint, inclusions in a diamond make each stone entirely unique. Small inclusions that are not visible by eye are a precious reminder of the miraculous, natural formation of diamonds within the earth, however larger inclusions and flaws can ultimately be detrimental to the fire and brilliance of your stone. Just as certification is essential, so too is a detailed look at the diamond in question. Do not settle for sub-par imaging and do not rely solely on a lab report. Use trusted vendors such as Whiteflash for their integrity and high quality diamonds that come with both a GIA lab report and the advanced technology to view your diamonds in the best conditions possible.